3KW Steam Shower Room Steam Generator (Black) S163 PS006-F. This S163 steam generator can be used in conjunction with the S163 control system. It can be used as a replacement for a faulty generator or can be used to create a new steam room. 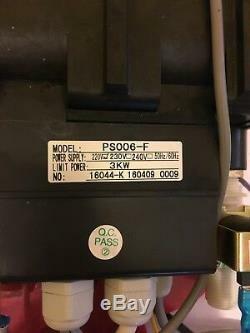 The steam generator is very easy to replace using plug and play style connections. Replacing this steam generator doesn't require specialist experience and any qualified electrician should be able to switch it. The 3KW steam generator can fill up a room between 2.5 and 5 metres cubed. 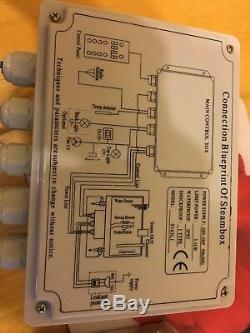 S163 Steam Shower Control Box. This control box is used on some Cecina and Savona steam showers in Di Vapor's range. The control box controls the S163 steam generator and control panel. It can control the following features on the steam shower. Circulation Fan - FM Radio with Speaker - CD & MP3 Feature - Overhead white L. The item "3KW Steam Shower Room Steam Generator (Black) S163 PS006-F + Control Box" is in sale since Sunday, January 13, 2019. This item is in the category "Home, Furniture & DIY\Bath\Whirlpool/Spa Baths". 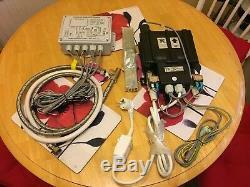 The seller is "r112uk" and is located in Bedford.